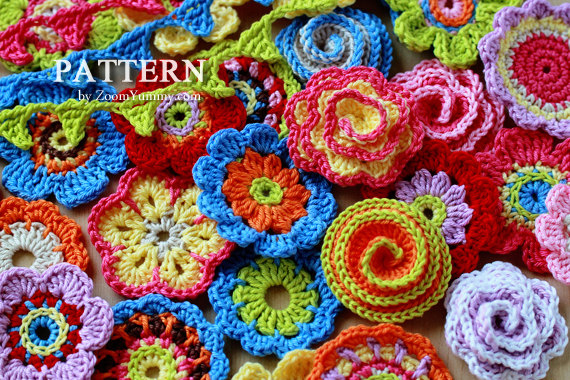 ‘Big Flower Party’ is a collection of crochet PDF PATTERNS which contains patterns for 10 lovely Crochet Flowers and a cute Mini Bunting. The pattern that you will receive is very detailed. It comes with a 33-page easy to follow written instructions and PHOTO TUTORIAL (!). The photo tutorial contains 97 (!) helpful STEP-BY-STEP pictures to make the project as easy to follow as possible. I highly recommend any of Petra’s patterns/tutorials. I have purchased several (including the flower party featured here) and they set the bar for what I expected if I purchased others’ patterns. Let me tell you, Petra puts so much into her patterns. There are written instructions, photo tutorials, step-by-step photos of her hook working each step to get you going with what she’s referring to with her written instructions, so that you can then learn to do the things she writes about when it repeats itself. There are conversions, supplies lists (with photos). I am so pleased with how much comes in a pattern purchase! I thought everyone on Etsy was offering the same amount of info, help, variety of instruction styles. WRONG! I tried two other vendors, and my reaction was ‘That’s ALL? But HOW do I do that? I don’t understand!”. It was then that I realized how superb the package Petra puts together when she sells a pattern. I’ve Learned so much from her, and had the best teacher in the world!